Viola de Hoog was the cellist of the Schoenberg Quartet. However, alongside her affinity with the music of the Second Viennese School, she has developed all the requirements of technique and stylistic sensitivity to be a formidable player of the Baroque form of her instrument. This issue is noteworthy for its fine sound and for the elegance and finesse of the playing. De Hoog has a light touch when playing chords: in the Allemande of the Sixth Suite she sketches in the harmony while allowing the listener to concentrate on the beautiful, ornamented melodic line. Another recurring attribute is her poised vigour in the quicker dances, for instance the lively Courantes of the first three Suites. In the corresponding movement of the Fifth Suite, however, her search for liveliness leads to a hurried tempo; I feel that this Courante, closer to the French manner of Couperin, demands a more relaxed approach. And I’m not entirely convinced by the different tempi adopted for the pairs of minuets in the first two Suites. But elsewhere de Hoog, even at her most individual, is entirely convincing. This is certainly the case with her account of the Prelude to the First Suite – spacious and meditative, with a pervasive expressive rubato. The other preludes similarly have a distinct character. I especially enjoyed the start of the Fourth Suite which, with its awkward leaps, can sound uncomfortable but here sounds entirely suave and natural. The Sixth Suite’s Prelude, too, is pervaded by a joyful, bouncy sense of rhythm. Viola de Hoog’s interpretations place her midway between two other distinguished Baroque cello accounts. Jaap ter Linden is a very fluent player but his smoother style results in performances that appear less lively and imaginative than de Hoog’s, and his heavier playing of chords tends to interrupt the music’s flow. Roel Dieltiens’s performances adopt a more forceful, often virtuoso manner, with more detached and staccato playing, and sharper characterisation. 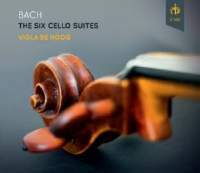 That is a most striking issue but I imagine many listeners will prefer Viola de Hoog’s gentler approach, as well as the more spacious recording and emollient tone.